I’m afraid this title is a little misleading. Yes, Pensacola is the primary training site for Naval aviators and home of the Blue Angels, the Navy’s Demonstration Team. We had hoped to watch the team practice as their Tuesday and Wednesday practice sessions are open to the public, but they had been away doing performances and there were no practices scheduled while we were there. Our primary purpose was to have some repairs done on our trailer. 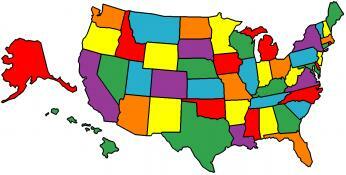 In the last eight years of fulltime RVing we have had good and bad experiences with RV dealer service departments. One of our favorite dealers is Carpenter’s Campers in Pensacola. They have given us consistently good service. We had to replace the awning fabric and the seals on our refrigerator doors. After eight years of constant use and, in the case of the awning exposure to the sun, they were just worn out. We also had a problem with our gas furnace that they fixed. I know many RV owners complain about RV service departments having their rigs in the shop for months getting things done. We try to avoid that in two ways. First, we let them know we are fulltime RVers and live in the rig, so we can’t just drop it off. Second, we work with the shop to agree on the date when the repairs will actually be done. We insure all of the parts are ordered ahead of time and on hand in the shop. Carpenter’s Campers was very good about working with us in this manner. Another repair that needed to be done was to replace the “D” seals on our slide outs. Eight years in the sun had dried them out. The cost of having the service department do this was way too much as it is very labor intensive. I purchased the seals from them and installed them myself. It took me three days (about five hours a day) to get them done. It wasn’t all work and no play. 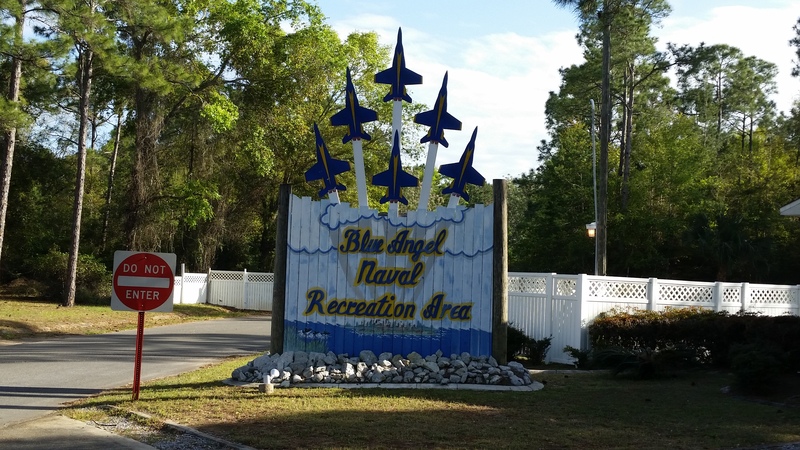 We stayed at the Blue Angel Recreation Area, part of Naval Air Station Pensacola and our neighbors hosted a happy hour on a couple of the days we were there and we got to meet some of the other campers in the park. The campground is right on the shore of Perdido Bay and we could enjoy of view of the water and sunsets right from our campsite. Some friends of ours from Michigan, Roger and Darcy, spend the winter in nearby Orange Beach, AL and we met them for dinner one night shortly before they headed back north. No matter where you are it’s always nice to meet up with good friends. One day we went kayaking along the shore in the bay. It was a beautiful day, warm, sunny, and light winds. They had done a “controlled burn” in the neighboring county park and we could see there were some fires still burning. I was concerned about this until I saw a maintenance truck patrolling through the area putting out these small spot fires. The real treat of the day was seeing many sting rays swimming in the shallow water. There had to be at least fifty of them! I have never seen this many sting rays in one area before and wished I had come prepared to snorkel while kayaking. It was difficult to get some good pictures, but I gave it my best shot! Roger and Darcy had told us about Joe Patti’s fish shop and the Palafox Market and we didn’t want to leave without checking them out. Joe Patti had started a small operation catching shrimp and selling them from the back of his house. Over the decades it has grown into a major operation selling local catch and importing fish from all over the globe. Here you can buy fish within minutes of it coming off the boat. I could see people cleaning and preparing the fish in the back work areas. Every Saturday the Palafox Street is turned into a street market with vendors of all kinds of goods and food as well as street musicians. It’s a great location to pick up local produce and unique gifts and we did take time to enjoy a Nutella and strawberry crepe. At the north end of the market the Christ Episcopal Church was open for visitors. It reminded us of the many churches we visited on our tour of Germany in 2017. The stained glass windows and domed ceiling were impressive and learning of the history of the church made it special. Our last stop of the day was the Oar House restaurant. Located right on the river, we could watch the boats as we enjoyed fish and shrimp. The food and service was great and I would recommend it to anyone visiting the area. 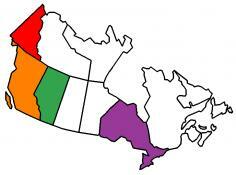 On Sunday, March 31st, we continued our journey north. Next stop – Fort Benning, GA and the Uchee Creek Campground. 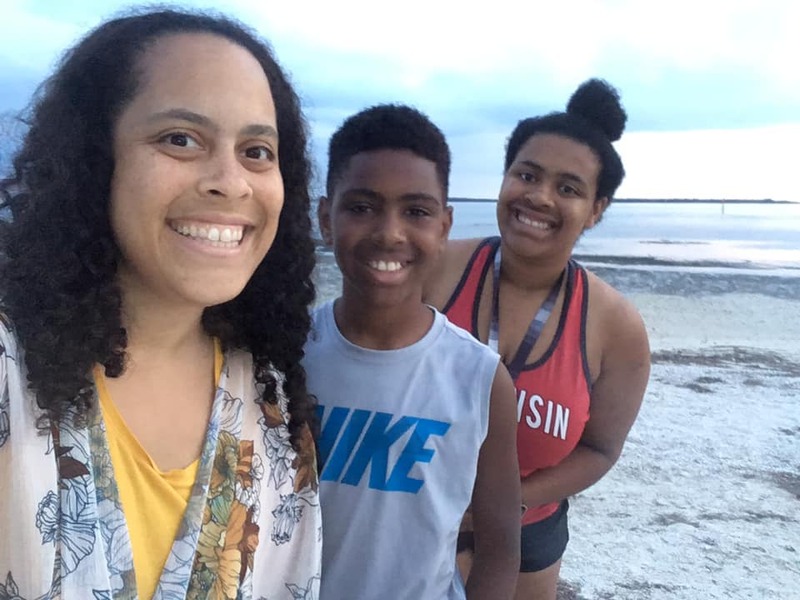 One of our priorities whenever we are in Florida is to spend some time with our niece, Robin, and her kids, Destiny and Jeremiah. This year and last year had the added benefit that Pat’s brother and sister rented a house near Robin for a month so we get to see even more family! We stayed at the Bay Bayou RV Resort near Oldsmar. This is a nice park, well maintained, and with the added benefit that it is close to Robin’s apartment. There are nice routes for cycling and walking from the park as well as a convenient kayak launch. One of our first activities was to drive to Lakeland to watch the Detroit Tigers at Spring Training. I can’t remember the last time I was at a major league baseball game. I think the Tigers have some work to do to be ready for the regular season; we were disappointed that they didn’t give us the win we were all hoping for. An added bonus was meeting one of my old National Guard buddies. You just never know who you will run into these days. The next day we headed to the beach on Honeymoon Island. What else would a bunch of refugees from a cold Michigan winter want to do but soak up some sun! It was nice to hang out, wade in the Gulf of Mexico, and toss a Frisbee around. The sunset was great, but the afterglow was outstanding! Jeremiah is very much into sports, especially football. Even though he is in Sixth Grade he already plans to play in the NFL! We were fortunate that he had a game on Saturday and the whole family was able to watch him play and cheer him on. He is really quite good and plays hard to support his team. Last year we went to the horse races at Tampa Bay Downs and enjoyed it so much we went back again this year. Admission is only $3 on the weekends and free during the week. The program gives you all of the races and which horses the odds makers have favored to win. The problem is if you bet on the favorite you don’t make much profit from your bet and if you don’t bet on the favorite you increase you potential profit, but also increase your chances of loosing. However, the minimum bet is only $2, so you can have a lot of fun taking a small chance. It makes for a reasonably inexpensive entertaining afternoon. While we were busying doing all of this, we filled in the gaps with going out to dinner. We ate at some great restaurants, but our best meals were the ones we prepared for each other at the house. Our time together was fun and ended too soon. Sunday, March 16th we headed up the road on our way to Pensacola. Key West is known for its easy going, laid back attitude, but our social calendar was always full. There was always something going on in the campground, or sponsored by someone in the campground. 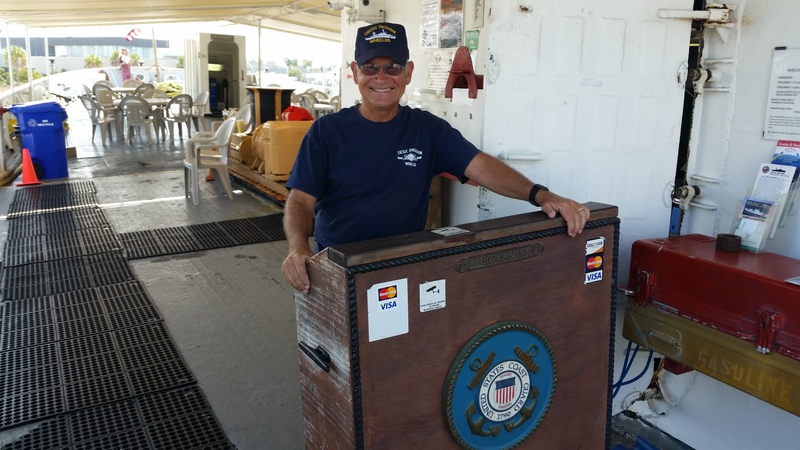 Every Tuesday afternoon I volunteered as a docent on the Coast Guard Cutter Ingham Museum. It’s a lot of fun meeting people who are in town for a short visit or off a cruise ship. We give them a chance to see history up close onboard the cutter. It’s a pleasure to be a part of this crew and to preserve some history. One afternoon a bunch of us rode our bicycles into Key West to visit the Key West First Legal Rum Distillery, the first legal distillery in town. We sampled a variety of rum, took a tour of the distillery, and had a presentation on how to make an authentic Cuban Mojito (with samples of course!). We finished the evening with snacks and drinks at a local establishment for happy hour before we rode back to the campground. Eddie and Tina Grooms are the party masters of Sigsbee Island. They planned the Sigsbee Shuffle in January and did an excellent job. They grew an event that had been limited to 40 people to 140 participants and still kept everything smooth and fun! Last year they had held a blind wine tasting that had about 29 wines entered into the contest, this year they did it again with 75 entries! Only Eddie and Tina could pull this off without a hitch and they did – What fun! They divided us into three groups, with 25 wines for each group. There were breaks for food, so we still had taste buds left for the later wines. I had entered my homemade “Green Apple Riesling and it took first place in its group of 25. I can now say I have made an award winning wine! It’s just not right to watch the Super Bowl without a party and there were multiple Super Bowl parties in the campground. In our case the game was projected onto a screen with the sound broadcast through one of our musician’s amplifiers. There was plenty to eat and drink as well as fans for both teams. The friendly rivalry was active and fun. Every year I present a class on how to make your own homemade wine. In the class everyone gets to see the process and tools for each step of the wine making process and wrap it up with a tasting of a variety of my own homemade wines. Everyone seemed to find it interesting and definitely enjoyed the samples! I play my guitar in the Praise Band for the base chapel and one Sunday we had a special guest show up for services, our Vice-President Mike Pence. Apparently the Chaplain only had 20 minutes warning before Mr. Pence showed up and I didn’t even know he was there until I saw him in the congregation. I guess now I can say I performed for the Vice-President of the United States! SCUBA diving is popular in Key West. 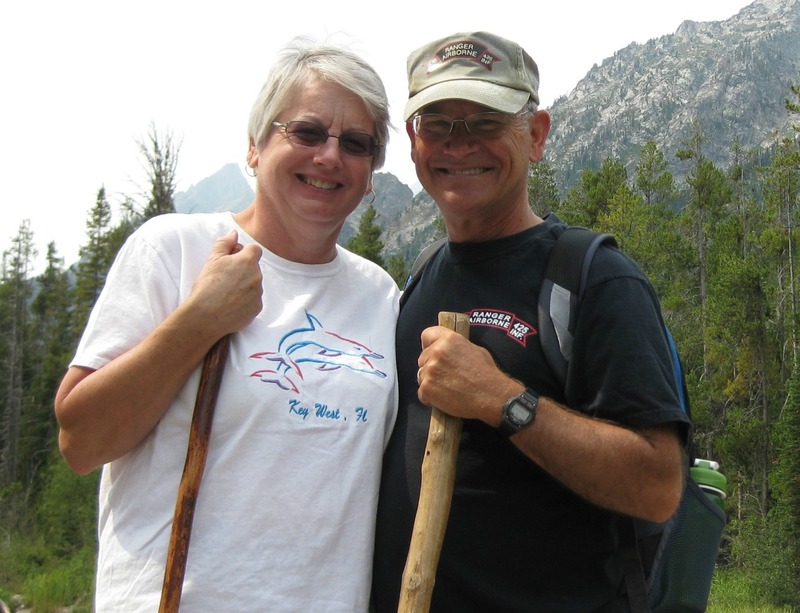 Ed and Ruth Kluk, friends from Michigan are both avid divers. We dove on a couple of reefs and the second largest artificial reef in the world – the General Hoyt Vandenberg. Formerly an Air Force tracking ship, the Vandenberg is both a challenging and rewarding dive. Again we went out for a sunset cruise on the Appledore Star with some friends that came to town for a brief visit. 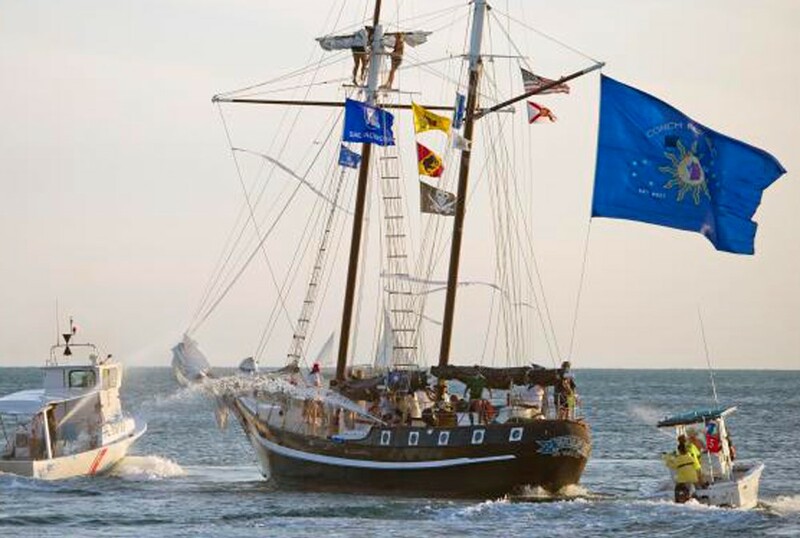 Key West offers a number of offerings of sunset cruises and the Appledore Star is our “hands down” favorite. The crew is great, interacts with the passengers, and will let you take a turn at the ship’s wheel. We finished the evening with coffee and key lime pie at Kermit’s Key Lime Pie Shoppe. One of my musician friends, Harriet Riendeau, (www.sweetharriet.net) and I put on a folk music performance at our campground community center. We called it a Happy Hour Folk Music Performance and did it on a Sunday afternoon. When we scheduled it we didn’t know that we were in conflict with two other events, but we still had more than thirty people in the audience. I’m not sure who had more fun – the audience or Harriet and I! Every weekend there is a big Flea Market on Big Pine Key and a bunch of us drove up to check it out. 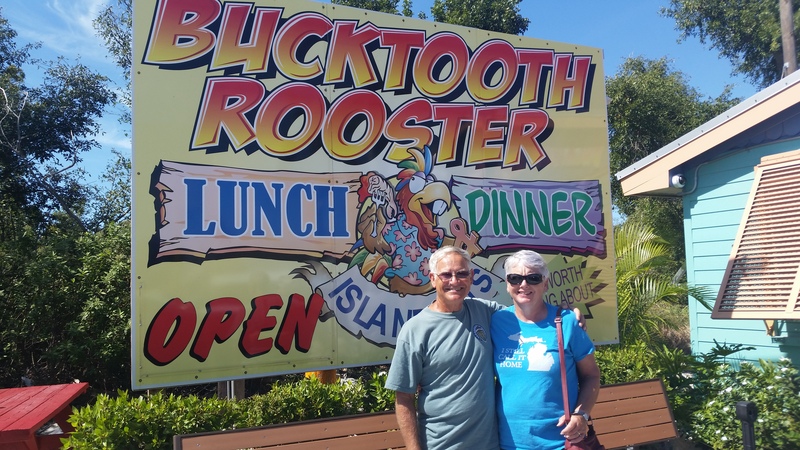 It was interesting browsing the various booths, but the hit of the day for me was stopping at the Bucktooth Rooster for a huge rack of ribs. There was enough left for dinner the next day! One of the new events this year was the Survivor Challenge. A take off of the TV show, our Challenge had a scavenger hunt, limbo contest, puzzles, coconut toss, and a kayak race. It took a lot of effort to put it on but was a lot of fun. I have no doubt it will back again and even better next year. Sunsets in Key West are always fun and one of the best spots for sunset is the Coast Guard Cutter Ingham Museum. Every Friday and Saturday night they open the ship for a Sunset Happy Hour. As opposed to the popular Mallory Square, the atmosphere is calm and the view is great! This night we were joined by two of our friends, Dave and Suzie Cook. The night we were there was a special occasion as one of the Admirals of the Couch Republic Navy had passed away and they did a wreath toss and 21 Gun Salute in his honor. This was followed by a great dinner at Jack Flat’s on Duval Street. One of the last things I did this year was visit the Key West Lighthouse and the Shipwreck Museum. The Shipwreck Museum does an excellent job in describing the work of the wreckers in Key West. These brave men would sail and row out to ships that had foundered on the off shore reefs, to save the crew and salvage the cargo. At one time this activity made Key West the richest city, per capita, in the U.S. Docents in period costumes are stationed throughout the museum to help guests explore and get a deep understanding of the wrecker industry and modern day salvage operations. The Key West Lighthouse is a self-guided tour that gives you some great views of the island from the top of the lighthouse. I have learned a lot about lighthouses over the years. Here I learned that, while General George Meade is famous for his Civil War duty, he was the Army engineer that designed and supervised the construction of many of the lighthouses in Southern Florida. Finally, our time in Key West came to an end and we were UTR (up the road) on March 4th. Rest assured that we will be back next year to enjoy all of the fun times with our many friends! I wonder how many visitors to Key West realize they are visiting an island that was once a foreign nation. According to my local friends, the US Border Patrol, in 1982, set up a roadblock and inspection point on US-1 just south of Florida City. Vehicles were stopped and searched for narcotics and illegal immigrants. The Key West City Council complained repeatedly about the inconvenience for travelers to and from Key West, claiming that it hurt the Keys’ important tourism industry. The City Council’s complaints went unanswered by the U.S. federal government, and attempts to get an injunction against the roadblock failed in court. As a form of protest Mayor Dennis Wardlow and the Council declared Key West’s independence on April 23, 1982. In the eyes of the Council, since the U.S. federal government had set up the equivalent of a border station as if they were a foreign nation, they might as well become one. As many of the local citizens were referred to as Conchs, the nation took the name of the Conch Republic. On April 23rd Mayor Wardlow was proclaimed Prime Minister of the Republic, and immediately declared war against the United States. 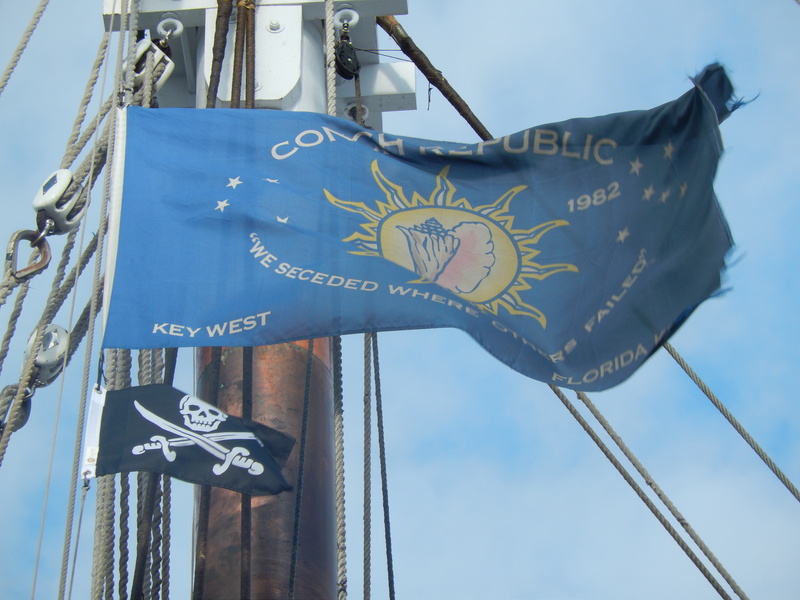 The Conch Republic Flag was raised over City Hall and the schooner Western Union, under the command of Captain John Kraus, went forth into the harbor and attacked the Coast Guard Cutter Diligence with water balloons, Conch fritters, and stale Cuban bread. The Diligence fought back with fire hoses and thus commenced the Great Battle of the Conch Republic. Prime Minister Wardlow surrendered and demanded foreign aid (which they are still waiting for). Although the US government never recognized the independence of Key West, the border checkpoint was closed and the Conch Republic was born – at least as a marketing strategy. In 1995, it was reported that the 478th Civil Affairs Battalion of the United States Army Reserve was to conduct a training exercise simulating an invasion of a foreign island. They were to land on Key West and conduct affairs as if the islanders were foreign. However, no one from the 478th notified Conch officials of the exercise. Seeing another chance at publicity, Wardlow and the forces behind the 1982 Conch Republic secession mobilized the island for a full-scale war (in the Conch Republic, this involved firing water cannons from fireboats and hitting people with stale Cuban bread), and protested to the Department of Defense for arranging this exercise without consulting the City of Key West. The leaders of the 478th issued an apology the next day, saying they “in no way meant to challenge or impugn the sovereignty of the Conch Republic”, and submitted to a surrender ceremony on September 22. The Conch Republic actively maintains an Army, Navy, and Air Force whose primary duties are to help re-enact the Great Sea Battle of 1982 and the retaking of Fort Zachary Taylor. The Navy comprises no fewer than 10 civilian boats and the schooner Wolf under the command of Admiral Finbar Gittelman. The Army consists of the 1st Conch Artillery, garrisoned in Fort Taylor. The Conch Republic Air Force has more than a dozen appointed aircraft in its fleet. 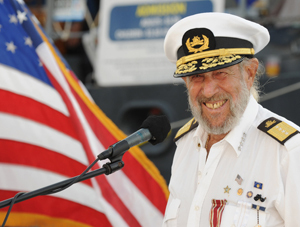 The Conch Republic celebrates Independence Day every April 23 as part of a week-long festival of activities involving numerous businesses in Key West. 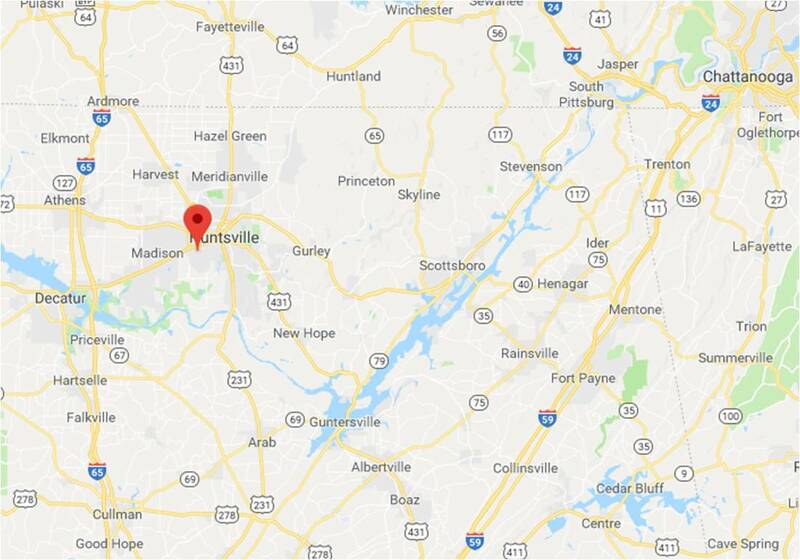 The organization — a “Sovereign State of Mind”, seeking only to bring more “Humor, Warmth and Respect” to a world in sore need of all three according to its Secretary General, Peter Anderson — is a key tourism booster for the area. Through their website, the Republic issues souvenir passports. These are issued as souvenirs, but some have evidently bought them in the mistaken belief they are legitimate travel and identity documents. 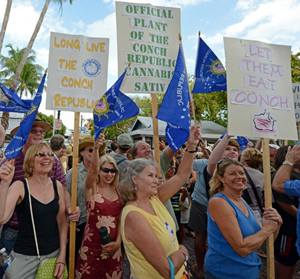 The Conch Republic is alive and well in Key West. When you visit Key West you see all kinds of references to the “Conch Republic.” Most tourists write it off as a quirky nickname. Very few of them understand the Conch Republic is real – well, sort of. 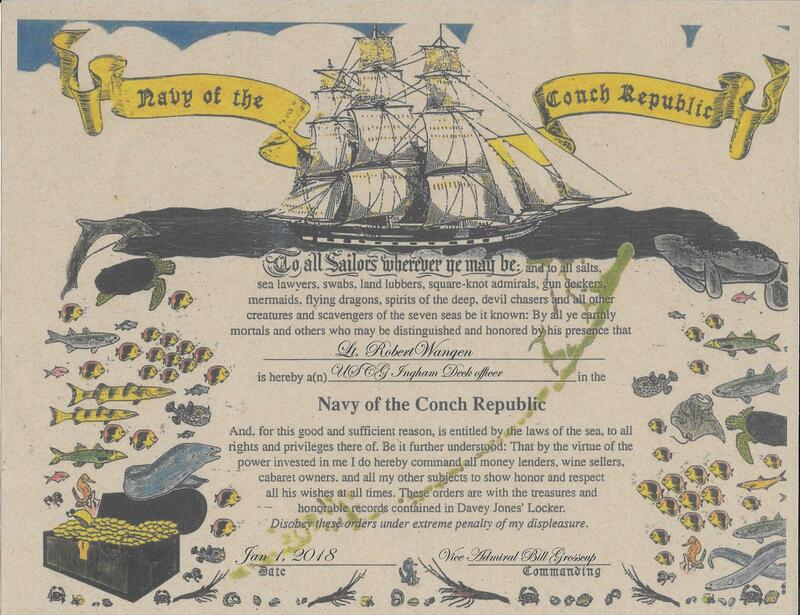 As a result of my volunteer work on the Coast Guard Cutter Ingham Museum it was my honor and privilege to be certified as a Deck Officer in the Navy of the Conch Republic. Yes, Key West is a unique place to visit and I encourage you to put it on your list of places to explore! Our favorite place to spend the winter is the Sigsbee Island RV Park – part of Naval Air Station Key West. We enjoy the warm weather, water activities, and the community of friends that we have made over the years. This year didn’t start off very good. We arrived late on December 29th and set up in “dry camp” where we have no hookups and have to use our generators for electricity and fresh water tanks for water. This is normal and was not a problem. However, we soon discovered that our generators didn’t want to run very well and our water pump was broken – not the kind of thing you want to discover at 7:00 at night. But the next morning I was able to trace the electrical connections to verify that it was the pump that was bad and we ordered a replacement. Then I turned my attention to the generators. I was surprised to have problems with them. 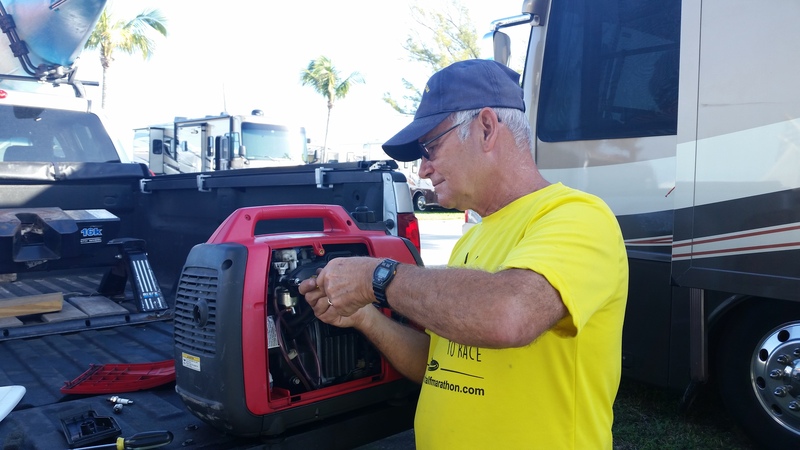 We have owned our two Honda generators for over seven years without any problems. They are almost indestructible, you can fail to perform scheduled maintenance and they still run fine. I drained the carburetor bowl, and changed the spark plugs. I watched several YouTube videos and took the carburetor apart to clean what I could, and still had problems. Finally I contacted a nearby small engine repair guy and had him tear the engine down and give it a good cleaning. Eventually I discovered that a switch on the fuel cap had been turned to OFF and that was preventing air from entering the fuel tank and, eventually, smothering the engine. I hadn’t touched that switch in seven years and it never occurred to me to check it. Well, while it was a frustrating two days, I learned a lot more about these generators and they should run fine for another seven years! All of this did not prevent us from participating in a Sigsbee Island tradition, the New Years Day Polar Plunge! 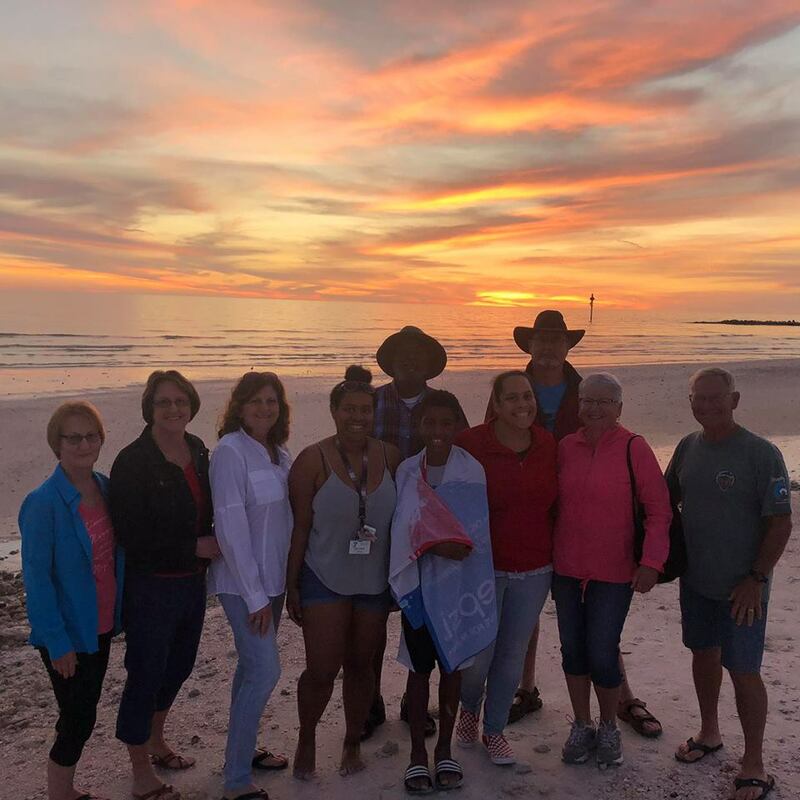 A large group of hardy campers braved the “freezing” 76 degree water temperature and simultaneously plunge into the “bone chilling” waters of the Gulf of Mexico. This is followed by clam chowder and mimosas as we celebrated a new year in Key West. A couple of days later our pump arrived and it was simple to install as I ordered the exact same pump, I didn’t even have to replace fittings. However, while it was simple it was not easy. The pump is installed in a very small space with an even smaller access hole. This required me to wedge myself into one of our storage compartments and twist and stretch like a contortionist to get everything hooked up. The good news is I was successful and we could now use our fresh water system. Frankly this is the only major system we have had to replace in seven years, so not too bad. 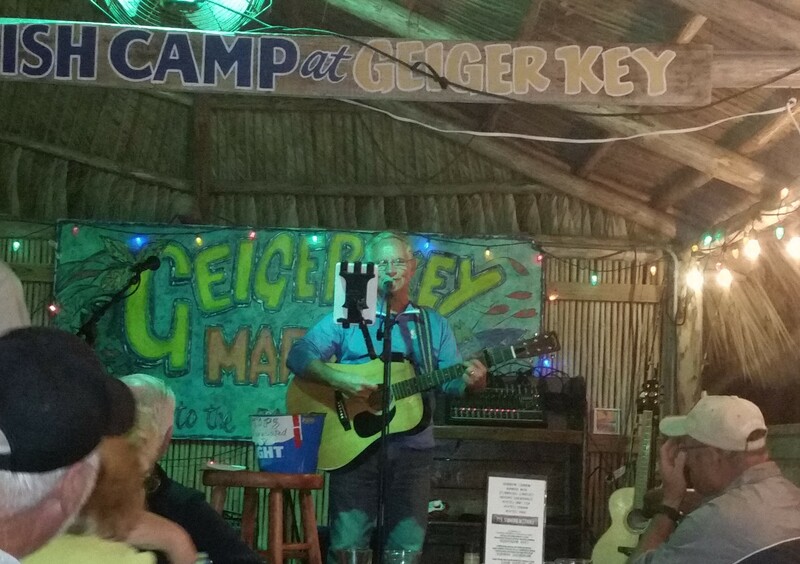 A bunch of us musicians (yes, me too) enjoy going to Open Mic night at the Geiger Key Marina and have a lot of fun practicing our musical skills before a live audience. The Marina bar is right on the water and offers good food, making it a great night out. Key West offers an annual Half-Marathon as a fund raiser for local charities. Our small military community embraces the military value of “selfless service” and supports this race with a host of volunteers that work in the registration process, as course marshals, as bicyclists making sure that racers with problems get help quickly, and manning water stations along the route. Last year the weather was cold and windy and this year it was wet and windy, making it a challenge for both racers and volunteers. There is always something going on in the park, one example is the Sigsbee Shuffle. In the past this has been groups of forty campers moving, as a group, through four or five sites to share food and drinks and meet new friends. Because of some changes in the management this didn’t happen last year, so this year a bunch of campers put it together on their own. There was no forty person limit this year and approximately 140 campers moved from site to site. The organizers did an outstanding job and it went without a hitch. 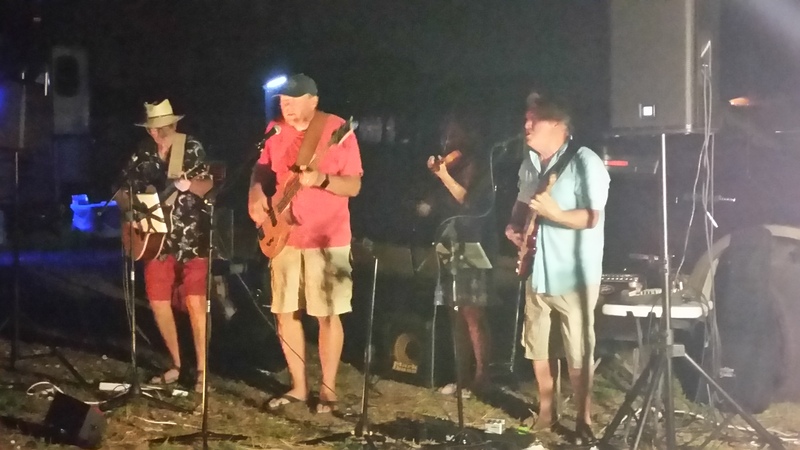 The finale was a performance by the No Name Band, a combination of campers and Key West locals. I was fortunate to be asked to open for them while they were doing their final set up. I’ll let you know when I get my recording contract, but don’t hold your breath! We have more than a month remaining on our stay and we are looking forward to even more opportunities for fun and enjoyment. There are plenty of things to see and do in the Cocoa Beach area. 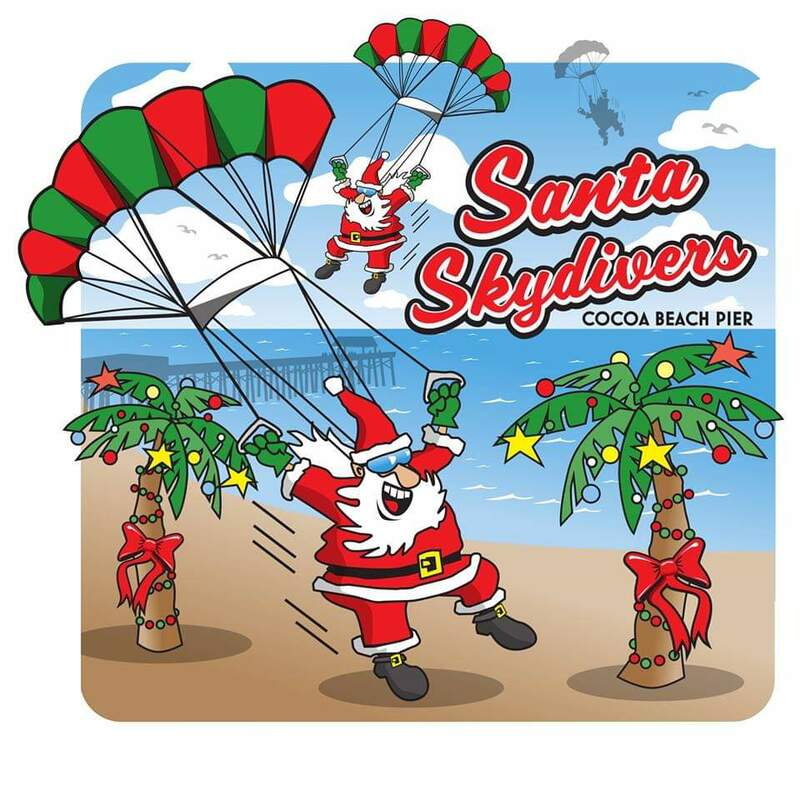 One of my favorite Cocoa Beach Christmas traditions is the Skydiving Santas. For the third year in a row the Air Sports Parachute Team has organized local area skydivers to put on this special event. More than 100 people dressed as Santas, Elves, and Grinches skydived near the Westgate Cocoa Beach Pier on Saturday, Dec. 15. The skydiving Santas were attempting to set a Guinness World Record by organizing the largest formation of flying Santas in the world, according to the event organizers. 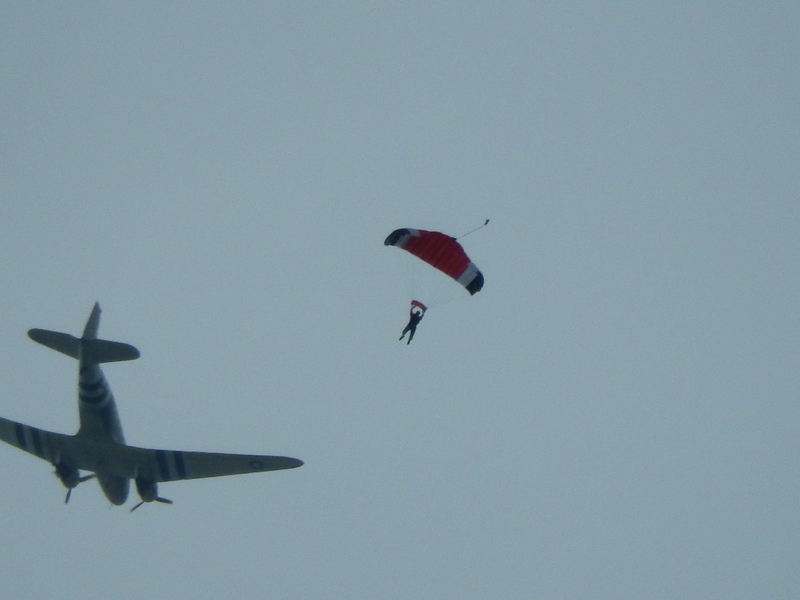 The Old Saint Nick parachutists attempted to land on a giant inflatable Santa chair, a Santa sleigh, and other objects. The show was set to start at 11:00 and we got there at 10:00 to make sure we had a good spot. The weather was “iffy” with overcast skies, possible rain, and chilly. That made for a light turnout and good seats for all. We were right on the edge of the drop zone directly across from the Santa sleigh – great spot! Shortly after 11:00 the first plane passed overhead and dropped its first stick of jumpers. As a former Army paratrooper I loved every minute. The winds aloft were tricky and a couple of the skydivers landed in the Atlantic Ocean instead of safely on the beach. On later passes the aircraft corrected its track and everyone made dry landings. The Santas, Elves, and Grinches were working hard to land on the sleigh or the chair. I was impressed and amazed at the chances they were taking to hit the targets. Fortunately we did not see anyone get hurt and they were really entertaining. Unfortunately a front moved through the area and the rain started. It looked like it was going to last for a couple of hours so we called it a day. It was too bad as I could have watched for a lot longer. If you are ever in the Cocoa Beach area in mid-December check it out! 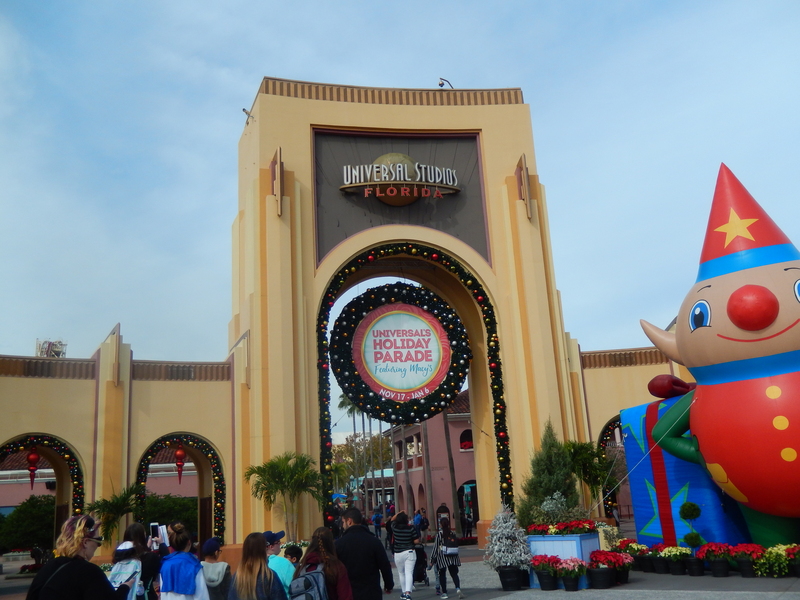 Patrick AFB is not far from Orlando and we decided that a trip to Universal Studios was in order. We had seen the advertising for the Wizarding World of Harry Potter and that was our primary motivation and goal for our visit. When we talked to our daughter, Elisabeth, she thought it sounded like a great idea and asked to come along. So why not? We told her we would pick her up at the airport in Orlando. We bought our tickets at the Information, Travel, and Tickets (ITT) office on base and borrowed a couple of guide books at the base library. After we picked up Elisabeth and returned to our hotel, we made our plan for visiting the park. We took the shuttle from the hotel to the park each morning, certainly more convenient and cheaper than driving and parking. Our first stop was Diagon Alley to buy a Wizard’s wand. Ollivander’s has all kinds of wands, including those used by each of the Harry Potter wizards. Elisabeth bought herself an interactive wand. Within Diagon Alley and Hogsmeade there are spots where you can use these interactive wands to cast spells. Fortunately for these new, unskilled wizards there were experienced wizards nearby that could offer assistance. All of the guide books commented on how well the buildings in Diagon Alley and Hogsmeade match the descriptions in the Harry Potter books, and they were more than accurate. We felt like we were in those magical places. This feeling was enhanced by watching visitors of all ages dressed in Hogwarts wizard robes. In addition to the rides and casting spells with Elisabeth’s Wand, we sampled authentic Butter Beer and a couple of shows. I think the best show was the light show at Hogwarts Castle. If it wasn’t for Elisabeth I might have been content with just visiting The Wizarding World of Harry Potter. She wanted to do all of the rides and that worked for us. Universal Studios did an excellent job in designing their rides. With the combination of roller coaster type vehicles with 3-D projection, the result is a wild ride that puts you right into the movie. In addition to Harry Potter and the Forbidden Journey (hold on to your stomach for this one), the Hogwarts Express, and Harry Potter and the Escape from Gringotts, we rode Fast & Furious, the Rip Ride Rockit, Jurassic Park River Adventure, MEN IN BLACK Alien Attack, Revenge of the Mummy, Race Through New York Starring Jimmy Fallon, and more. I couldn’t get many pictures because we weren’t allowed to take cameras on the rides. Some shows are special during the holidays, like the “Grinchmas” performance. After three days in the park we drove back to the Manatee Cove RV Park. From there we played in the waves of the Atlantic Ocean, paddled our kayaks with the dolphins at Haulover Canal in the Merritt Island National Wildlife Refuge, and watched some great sunsets over the Banana River. Sunday found us driving Elisabeth back to the airport in Orlando. We’re already looking forward to seeing her and the rest of the Washington State family in June.